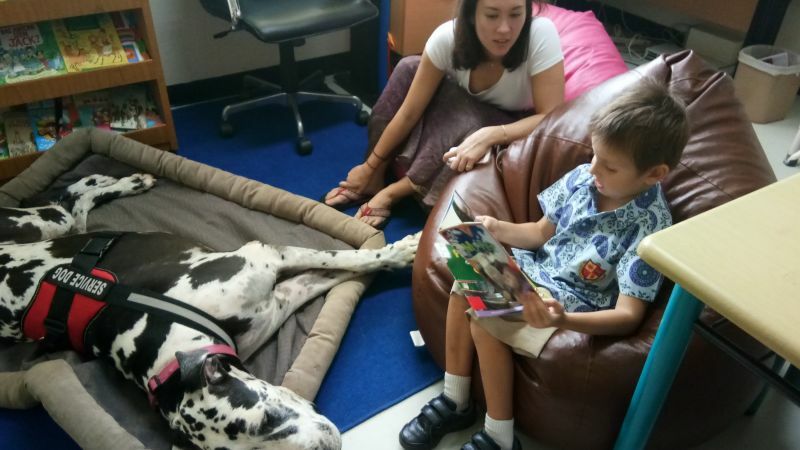 These dogs are certified Therapy Dogs from Therapy Dogs Phuket, and their job is to help create a learning environment for children to help improve and develop their reading skills. This program is becoming so successful, that we need more dogs and handler teams. Many children naturally enjoy reading and need little encouragement, but if they are struggling their confidence can quickly diminish – and with it their motivation. Children who are struggling to read, for whatever reason, need to build confidence and rediscover a motivation for reading. And whilst they may feel self-conscious reading to an adult or peer, they are usually very comfortable reading to a therapy dog as they know that the dogs will not judge them. So our dog becomes a reassuring, uncritical audience who will not mind if mistakes are made. For more experienced or capable readers, they can experiment with intonation and ‘voices’, knowing that the dog will respond positively – building fluency and confidence, which further develops comprehension in readers. Reading to a dog can create a helpful balance, supporting literacy activities which may seem less appealing to a child. Children with dyslexia, for example, need focused support to develop their understanding of the alphabetic code (how speech sounds correspond to spelling choices). But this needs to be balanced with activities which support independent reading and social enjoyment, or the child can become demotivated. Sharing a good book with a dog enables children to apply their reading skills in a positive and enjoyable way. 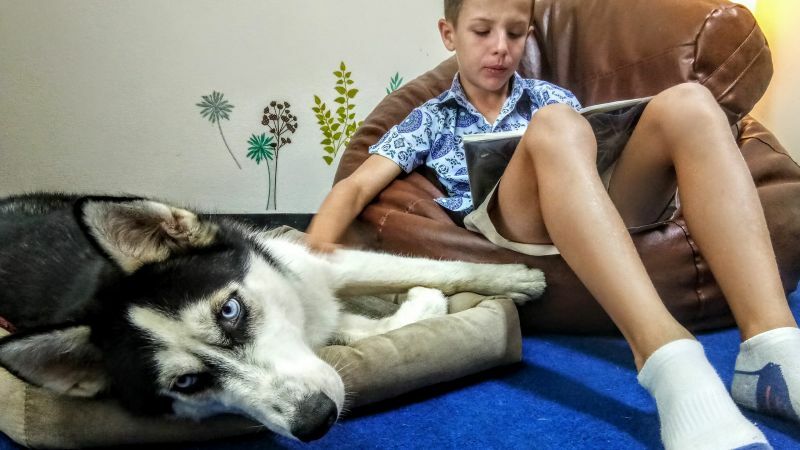 Studies on canine-assisted reading programs have found results for improvements in oral reading fluency and accuracy, along with significant increases in engaged reading time and significant improvements in reading skills, such as the ability to explain, describe, analyse, and infer. Closer to home at BISP, they have a range of ‘success’ stories, with a number of children showing marked improvement - not just in their reading skills, but also their general love of reading, and all round confidence. Every year we have a waiting list of children, who are super keen to join this amazing programme. 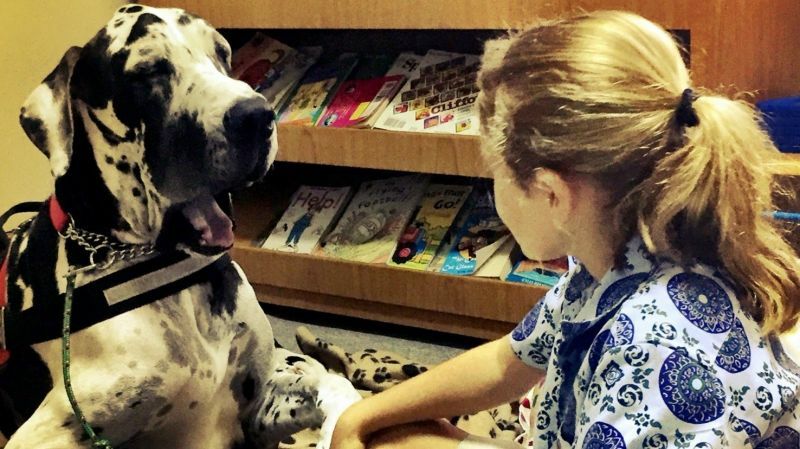 From Reception to Year 6, children with dyslexia, or low confidence, or children who just cherish to the opportunity to come and read to the dogs. When you ask the children why they enjoy it so much, their replies are similar: ‘the dogs just listen’, ‘they don’t interrupt me’ and ‘they love to listen to us’. Therapy Dogs Phuket (TDP), which run the Waggin’ Tail Tutor program, is an offshoot of Therapy Dogs International which is dedicated to regulating, testing, and the registration of therapy dogs and their volunteer handlers. TDP works closely with Canine Point Academy, the only organisation in Thailand that can certify Therapy Dogs. As well as their continuing program at British International School, Phuket, TDP have been requested at other schools here in Phuket - and as such, need to recruit more dogs and handler teams to join. So if you and your dog could commit to once a week, or once a month, then please get in touch!